We started the week talking Amish population–so why don’t we close doing more of the same! There are 480 Amish settlements, but most are small. Fifty-two percent of all settlements are just one district in size. There are an estimated 2,119 church districts. Ohio, with nearly 500, has the most. As is always the case, Ohio, Pennsylvania, and Indiana are together home to the lion’s share of Amish people, at 64% of the total population. Eight states have just one Amish settlement. These include Delaware, Idaho, North Carolina, and Florida. The Amish are estimated to have grown by 3% in the past year, an approximate increase of 8,400 people. While we’re on the subject, I recently did a guest post on Suzanne Woods Fisher’s website Amish Wisdom, called “10 Facts About Amish Communities“, which you might enjoy (you can see I don’t get tired of this topic 🙂 ). Some of them you might have read here already, others maybe not. Unsurprisingly, the number of Amish settlements has also increased over the past year. According to reader Barbara Durham, one new community has been started in the area of Whitehall, New York (near the Vermont border). Baked goods, flower nursery, and a leather repair shop are the new offerings from them to the community. I also see over on Abair Road that they have some kind of sawmill at work. They purchased 3 already built homes, which they are occupying, this included the farm-land and barns. Cows are daily enjoying the high grass of the fields and you can see their crops peeking up through the plowed fields as well. 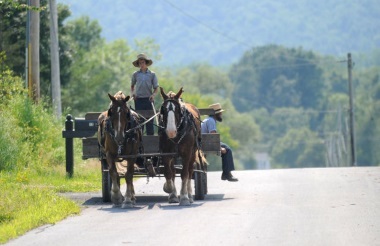 New York remains the state with the fifth-largest Amish population, at over 16,000. The state also has the third most settlements, with 50 (trailing only Ohio and Pennsylvania). The likelihood of Amish villages? Quick question, hypothetically, do you think that in the future the Amish would establish Amish centric villages [hypothetically speaking a cluster of homes, with maybe under 100 houses, also conventionally not wired to “the grid” as many homes are (aren’t) today], very small ones, to accommodate population growth, and start doing communal farming where multiple families work, or are supported by the crop, aside from the inclusion of non-traditional employment opportunities? I don’t know Shom, that sounds more like what the Hutterites do. I don’t think any changes that might happen in population patterns would be so much a conscious strategic change as much as they would simply evolve in one direction or another. Amish have a long tradition of farming as individual family units, albeit with a strong communal element, which you see in things like the threshing rings. Do the Amish participate in the US census? They do. There was an interesting study on Amish wealth distribution in the Journal of Anabaptist and Pietist Studies which used Census Tract data as part of its data gathering. I saw your list on Suzanne’s “Amish Wisdom” blog…always nice to see a familiar face, too, in my travels ’round the ‘net. On the subject of the Amish population doubling every 20 years, a friend and I were bemoaning the dismal state of affairs in the world today (planes being shot down, children immigrating to escape human trafficking and worse) and we both decided we hope it’s the Amish who will eventually “inherit the earth”. Glad you caught that post Alice Mary, it was fun. What you describe above is part of why I stopped watching the news a while ago. I still catch enough of what is going on that I don’t miss out on knowing. But most of it is bad news so I don’t really miss it. sehr guter Artikel. I still hope that someday soon, you or one of the more avid readers and participators here on AA will make the trek to Minnesota and write a more in-depth article on the Old Order Amischen here (the church districts around Bertha, Todd County, and in Fertile, MN), along with pictures. Wieder, sehr guter Artikel! Am I right in thinking that Colorado (Denver?) has only one Amish settlement or church district? It’s Mennonite, right? As Erik knows, I just got back from the community in Fertile, as we went to stay with my son who lives there. We had an exciting week of “being Amish”. I’m trying to get some thoughts together to send Erik for the blog, so maybe you’ll eventually hear some tidbits from a recent trip there. AND! We got lots of pictures! Gorgeous there right now! In the article, “Would You Guess There Are Fewer Amish Today? You’d Be So Wrong,” an accompanying map shows changing dots of the locations of Amish settlements in North America from 1964 to 2014.